This Wild Tomato Asparagus Salad reminds me of Italian summers and celebrates the sweet deliciousness of wild tomatoes and freshness of clean green asparagus. The crunchy green asparagus stalks combine really well with the sweetness of the oven-roasted wild tomatoes and balsamic vinegar. The tangy, slightly bitter taste of the arugula adds an extra bite and balances off the sweetness of the roasted tomatoes. For the tomatoes I use organic Wild Wonder Tomatoes, which is a mixture of different kinds of tomatoes with all different flavours and sizes. They come in red, yellow, green and all have a uniquely different taste. When roasted in the oven, the tomatoes get really juicy and all the unique flavours, from sweet to tangy, become even more profound. The green asparagus in this salad is both crunchy and succulent. Asparagus are true super foods. Who doesn’t love asparagus? Dutch people go crazy when the first white asparagus is harvested in April. Its arrival is celebrated throughout the country with harvest festivals. The first weeks of the asparagus season, asparagus is on on every restaurant menu and most people will eat tons of them in the first initial weeks when you can buy them in stores again. Although the white ones are considered the gems amongst the different types of the asparagus, I love the fleshy green ones best. I enjoy them most roasted in the oven or quickly grilled in a grill pan, so they still have a bit to them but are succulent and tender at the same time. They are a great addition to pasta or Mediterranean style salad. Asparagus are not only super delicious they are super healthy too. In ancient times, asparagus was valued widely for its medicinal properties, as a powerful healer and cleanser and even as a powerful aphrodisiac. It provides a unique combination of anti-inflammatory nutrients, such as saponins, and anti-antioxidant nutrients, including vitamin C, beta-carotene, vitamin E, and the minerals zinc, manganese, and selenium. It helps balance blood sugar, supports digestive health aids in nutrient absorption and can even play a role in preventing chronic disease due to its high content of anti-inflammatory and antioxidant nutrients. Recent research shows that asparagus is really great for a hangover too as it boosts levels of certain enzymes that help break down alcohol and as such help reduce the effects of a hangover. Learn more about the many healthy benefits of asparagus here. Cut in tomatoes in half and place them in a large baking tray. Add 1-2 tbs op olive oil, 1 tbsp of balsamic vinegar and sprinkle salt and freshly ground black pepper. Place in the oven for 15-20 minutes. Add asparagus to a large baking tray. Drizzle generously with olive oil and 1 tbsp of balsamic vinegar. Sprinkle with sea salt and freshly ground black pepper. Roast the asparagus in the oven for about ten minutes. They should be tender yet firm. Rinse quinoa well using a fine sieve. Cook for 8-10 minutes and allow to cool. You want to quinoa to still have a bite (al dente) and don’t go all mushy. 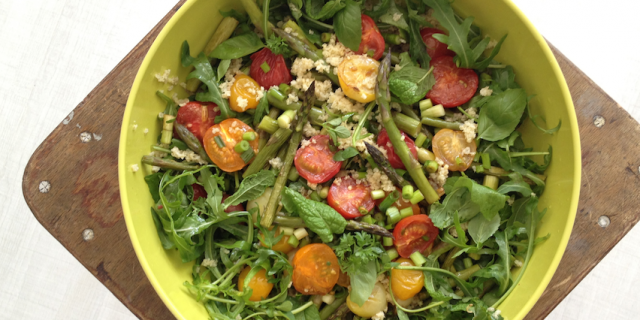 When cooled down, add quinoa to a large salad bowl and mix in the all the delicious juices from the baking trays in which you roasted the tomatoes and asparagus. This makes a really delicious dressing. Gently mix in the roasted tomatoes, asparagus stalks and arugula making sure you keep the tomatoes whole. Add fresh herbs (basil, oregano, mint) and, if necessary, some extra virgin olive and pepper and salt to taste.